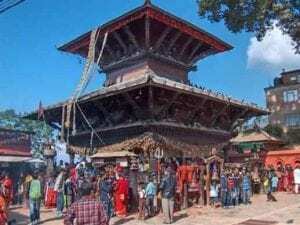 There are many temples all around the country in Nepal.�Previously, Nepal was a Hindu Nation but to address all religion, Nepal is now a secular country. Still, Hinduism is the most followed religion in Nepal. Nepal is well known for its temples and stupas. It is often called the country of gods and goddess. The capital, Kathmandu is called the �city of temples� and has many temples that represent the rich culture and history. Nepali temples are famous not only in Nepal but throughout the world where Hinduism exists. Today, we list the some famous temples in Nepal among Nepalese and international tourists. Among them, we have picked up top five famous temples in Nepal with a brief description of each. Pashupatinath is the World’s most significant Hindu temple. It is one of the most sacred temples of Hindu faiths. It is located on the bank of Bagmati river in the eastern part of Kathmandu. It is listed in the UNESCO World Heritage list since 1979. The main temple is designed in Nepalese Pagoda Style. There are many historical myths related to this temple. There is Lord Shiva Linga (idol) inside the main temple which can be touched by only 4 priests. Thousands of Hindus devotees visit this temple daily. The main festival like Shiva Ratri, Teej, Bala Chaturdasi is the time when millions of people all over the world come to worship this temple. Only Hindus are allowed to enter inside the temple. It is one of the UNESCO World Heritage Sites and needs no introduction. During shiva ratri Hindus from all over the world visit the temple and it is believed that every Hindu at least once in lifetime should visit the temple. Only Hindus are allowed to enter the temple while others can only visit the premises. The statue of Kali is here which represents one of the four time period of Hindu philosophy. It is believed that Kali was cursed by gods to be stoned underneath the earth surface, for marrying his mother. As per Hindu philosophy, the statue rises from the ground as the sins in the world increase and once it fully surfaces the world will end. Swayambhunath stupa is the ancient religious temple in Nepal. It was believed that Kathmandu valley was once a lake in between which there was a lotus. Manju Shree cut the gorge at chovar. Then, the pond became Kathmandu Valley, Lotus became the hill and flower turned into the Swayambhunath stupa. It is also known as Monkey temple since there are holy monkeys living in the northwest parts of the temple. It is listed in UNESCO World Heritage list. It has Stupas and different temples. For Buddhist, it is the most sacred Buddhist pilgrimage. You can view the whole Kathmandu Valley from this temple. It is one of the oldest religious sites of Nepal that shows the harmony between Hinduism and Buddhism religion. There is temple as well as stupa at the same place and it lies atop a hill in Kathmandu. 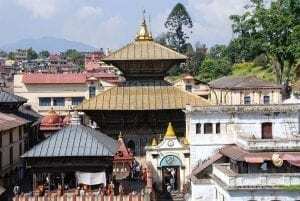 It is oldest religious site of Kathmandu and is listed in UNESCO world heritage site. It is located in the Muktinath Valley at the height of 3710 m in Mustang, Nepal. It is one of the sacred places for Hindus and Buddhist. It has many mythological beliefs according to both Hindus and Buddhist. It is near from Pokhara. It has 108 springs water and it is believed that by taking bath from all of these springs will wash out all your sins. It is also known by the name Mukti Kshetra which means place of liberation. The worship of temple is conducted by Buddhist in present of the Buddhist monk. It is said that Tibetan Guru Rinpoche, the founder of Tibetan Buddhism, had mediated in Muktinath on his way to Tibet. It is situated at an altitude of 3,710m in Mustang district. It is one of the biggest religious and tourist destinations of the country . It a preferred destination for adventure lovers because of the geographical difficulty. It has equal importance for Hinduism and Buddhism followers. Manakamana temple is the sacred place of Hindu Goddess Bhagwati, an incarnation of Parvati. It is located in the Gorkha district of Nepal at 1302 m above the sea level and about 140 km from Kathmandu. The Manakamana is derived from two words; mana means heart and Kamana mean wish. So, many Hindus believe that their heart wish will be fulfilled by worship the temple. To visit the temple, you have to take a drive of the cable car for a distance about 2.8 km from Kurintar. It was believed to be founded in the 17th century. 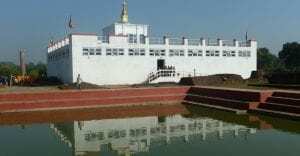 Lumbini is the Birth place of Gautam Buddha. It is located in Rupandehi District. It is one of the most famous Buddhist Pilgrimage sites. It has many other temples like Mayadevi temple, ancient monasteries, a sacred Bodhi tree, an ancient bathing pond, Ashoka Piller, monuments and a museum. This site is listed in UNESCO World Heritage list in 1997. Many tourists visit this site annually.